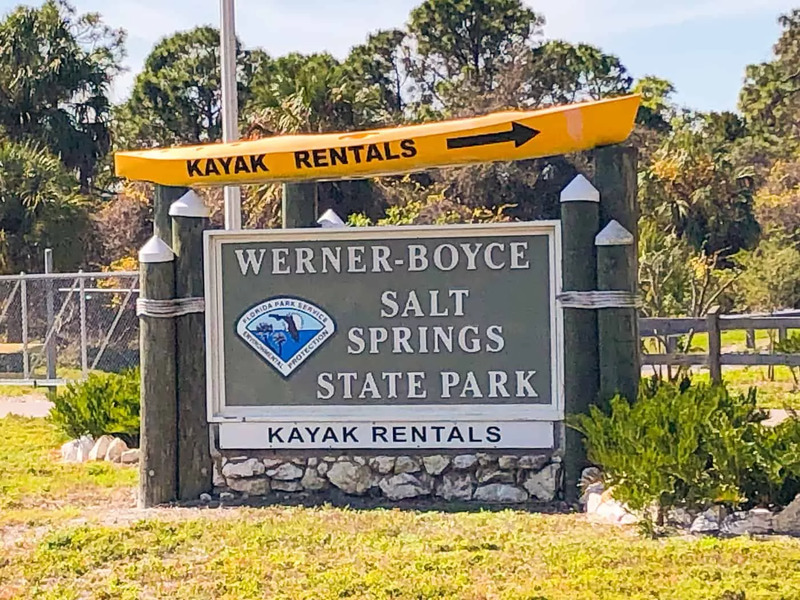 Located in Port Richey, Werner-Boyce Salt Springs State Park doesn’t look like much when you first approach. The main entrance is off a very busy highway and, if you weren’t looking for it, you would easily pass right by it. I’ve passed by its entrance many times and didn’t even know it was there! 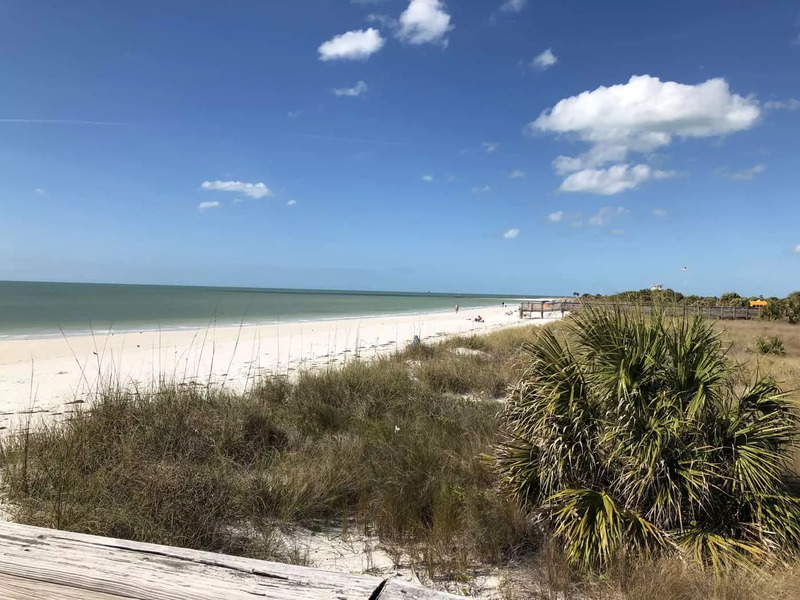 The park is located about 28 miles north of Clearwater, 11 miles north of Tarpon Springs and 1 hour west of Tampa International Airport. 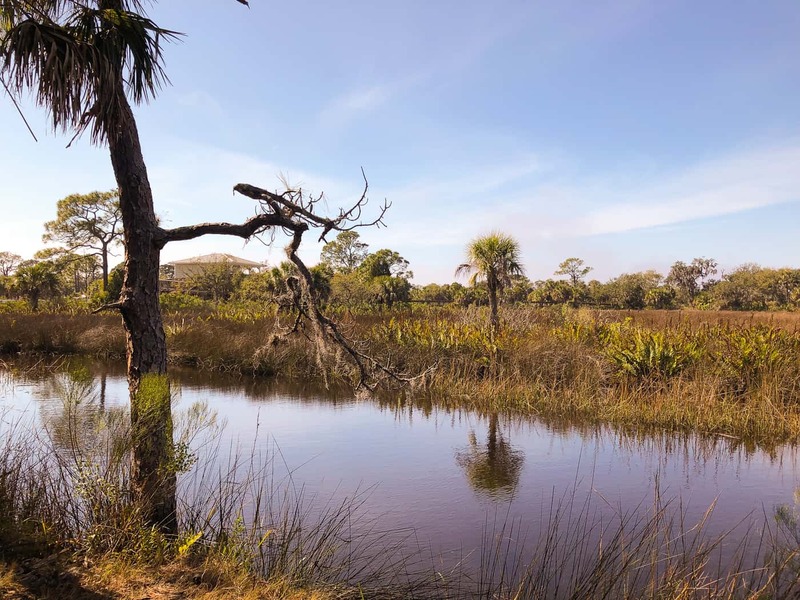 A protected 4 mile area that backs up to the Gulf of Mexico, the salt springs were used during the Civil War to excavate salt for the southern troops and during World War II was used as a spot to catch mullet to send overseas to the Allied troops. Be sure to bring cash with you when visiting Werner-Boyce – there is no guard station when you enter, only a money box. It’s based on the honor system. Florida State Park pass holders just drive through (I took my card out and waved it around in case anyone thought I wasn’t paying!). The cost to enter is $3 per vehicle, up to 8 people. If you’re riding a bike in or walking in, the cost is $2 per per person. The park is small so there aren’t a lot of the activities that you might see at the large state parks. It’s still a serene place to relax for half a day. There are three entrances to Werner-Boyce. The main entrance is off of US Hwy 19 and gives you access to the main hiking areas. There are two more side entrances, at Scenic Drive and State Road 52 that provide access to two additional trails but don’t have as many amenities as the main entrance. I hiked the springs trail at the main entrance. 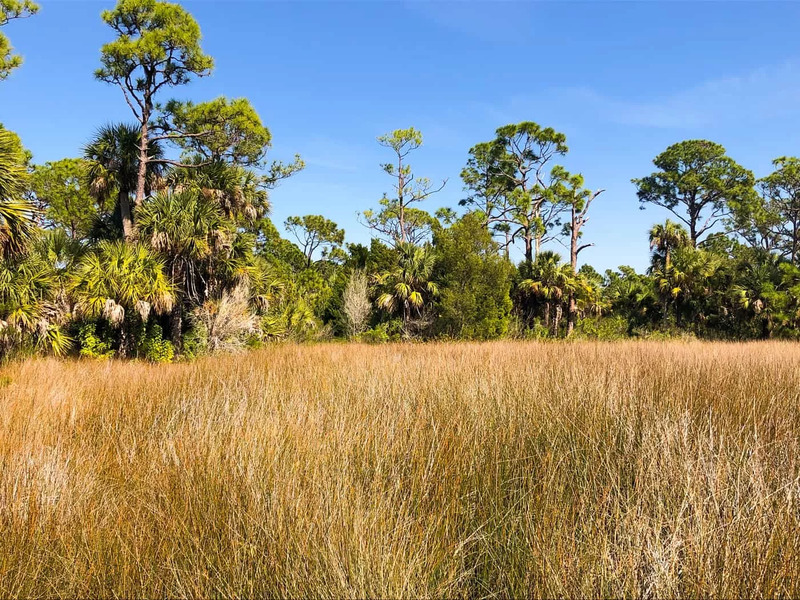 The landscape is varied from traditional Florida scrubs to high grass areas and there are seven sections, each less than a half mile each. There were a lot of people walking the trails on the weekday that I went, but in some spots it can be secluded. At one point I saw a trail made from the salt springs into the high grass area which to me meant ‘alligator!’. I never saw my assumed trail mate, but it was a good reminder to me to be aware of my surroundings, even though it was so peaceful and relaxing on the trails. There is access to the mangrove areas of the park at the main park entrance for you to put in a canoe or a kayak. 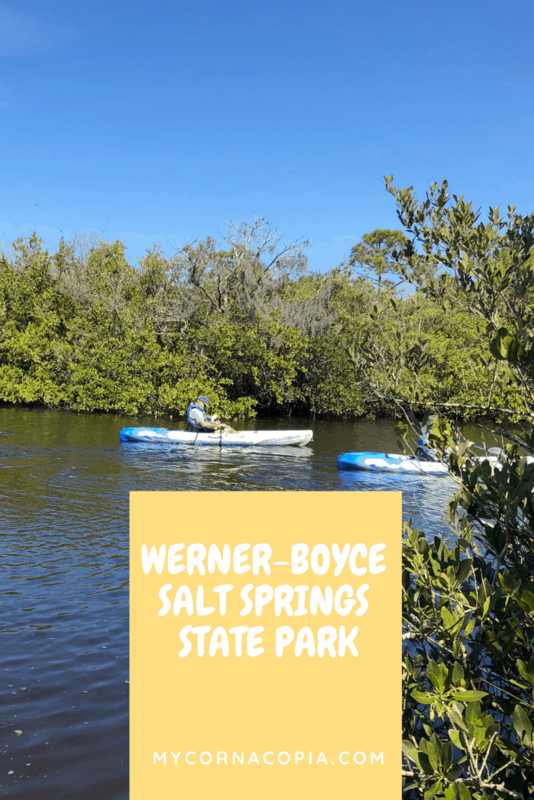 The paddling trails can take you through the salt springs or out to the Gulf of Mexico. Since the mangroves protect the shoreline, there is no swimming or beaches at Werner-Boyce. Before scheduling time to go out, make sure you check the tides. Paddling needs to be done during high tide due to the mangroves. On the first Saturday of each month a park ranger will take a group out for a guided kayak tour. Tours are limited to the first 12 kayakers. The tour company that rents out kayaks and canoes also offers tours and events. Check with park rangers that are onsite or at the information board next to the concession trailer for more information. Werner Boyce has an extensive amount of birds living within its park. 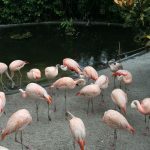 In additional to the traditional wading birds found in this area of Florida, bald eagles, Roseate spoonbills, black rails and other types of birds have been seen in the park. 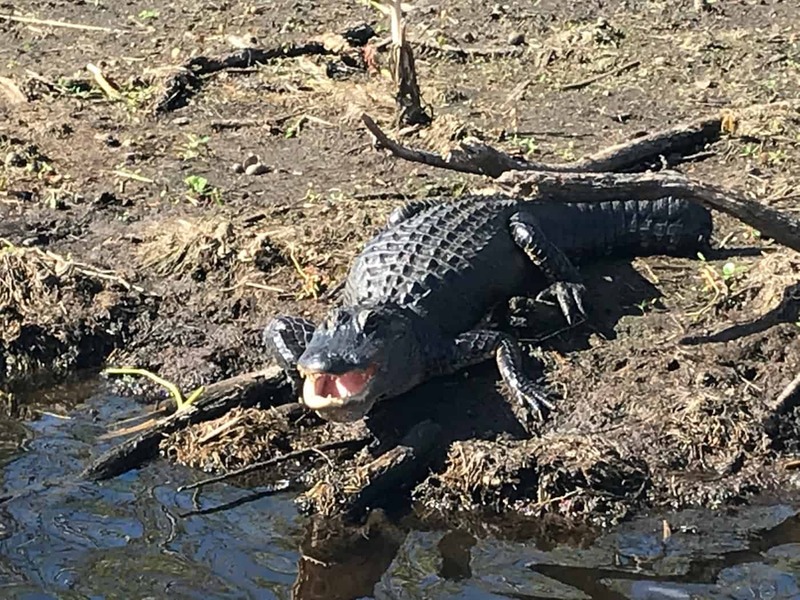 In addition to birds, there are traditional Florida wildlife to be seen such as alligators, snakes, racoons and gopher tortoises. Dogs on retractable 6-foot leashes are welcome on the trail. Please don’t forget to pick up after your pet! Restrooms and a small concession stand that offers sodas, water, bagged snacks, sunscreen and bug spray are both located at the main park entrance. 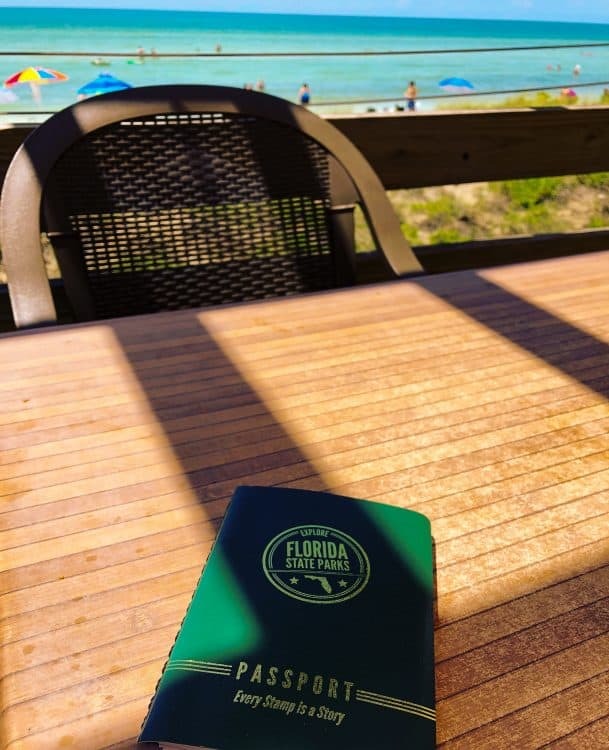 Get your Florida State Parks passport stamped at the concession stand. 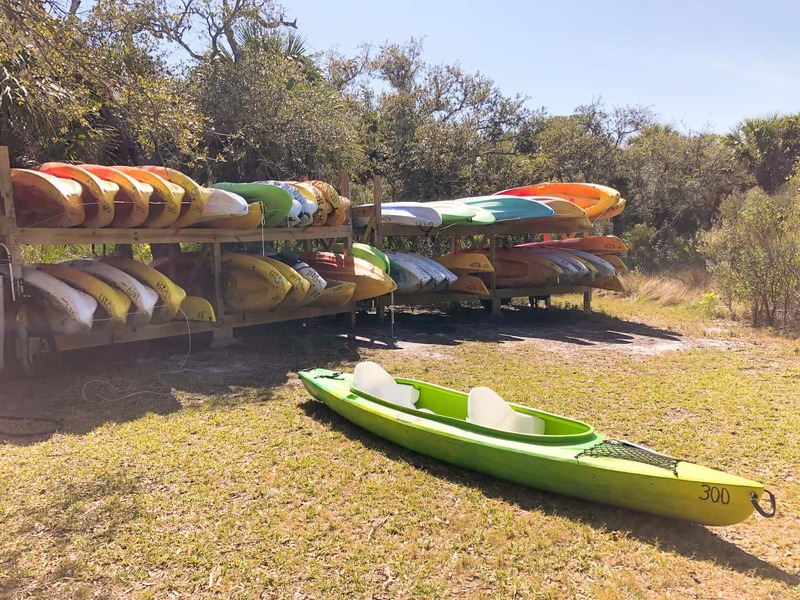 Canoes, kayaks and stand up paddleboards are available for rental from Paddling Adventures. Rentals are available every day from 8am to 3pm and rentals are due back no later than 5pm. There are no picnic pavilions available for rental at this park but there are picnic tables located along some of the trails. There are no sleeping accommodations at Werner-Boyce. 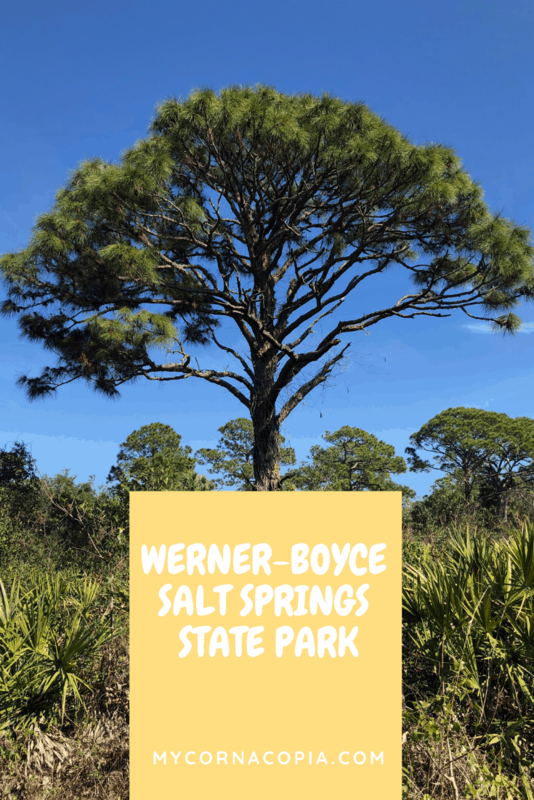 Werner-Boyce Salt Springs is open from 8am to sunset, 365 days per year. There are three entrances to the park. The main entrance (where most accommodations including restrooms and concessions are located) is at 8737 US Hwy 19 N, Port Richey, 34668. The park is on the west side of the highway – if you’re coming from the south you’ll need to make a u-turn to get into the entrance. The Scenic Drive trail entrance is located at 10333 Scenic Drive, Port Richey. The Black Rail trail entrance is located at 6641 SR 52, Port Richey. 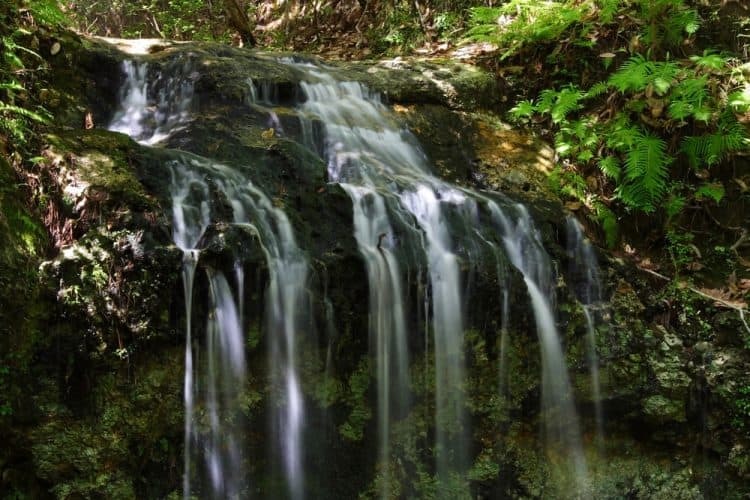 Welcome to the first official article on My Cornacopia about the Florida State Parks system! * As we’ve written in a previous post, we’ll be attempting to visit all 175 state parks in Florida. Some people don’t really experience Florida when they come to visit; they go to an amusement park and then head home. Which is like going to England, visiting Buckingham Palace and leaving. There’s so much more to Florida than rollercoasters and we’d like to introduce you to the unique outdoors that are available in the Sunshine State. 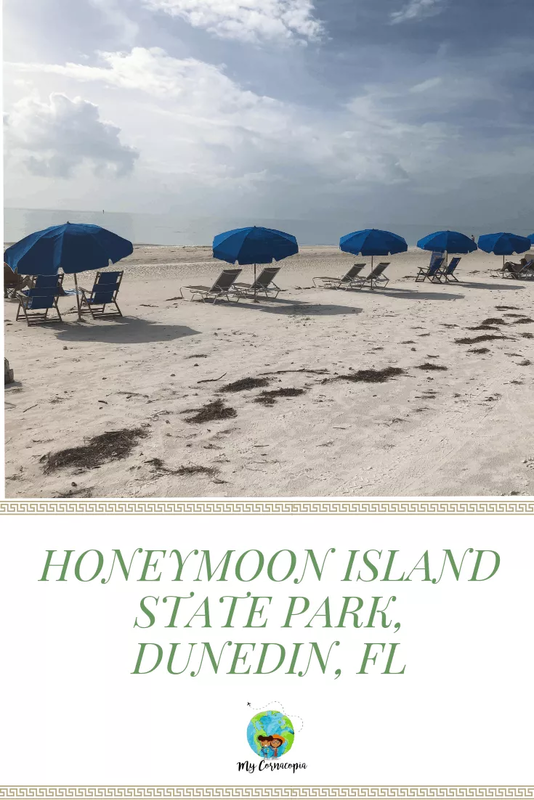 Our first park is Honeymoon Island State Park. 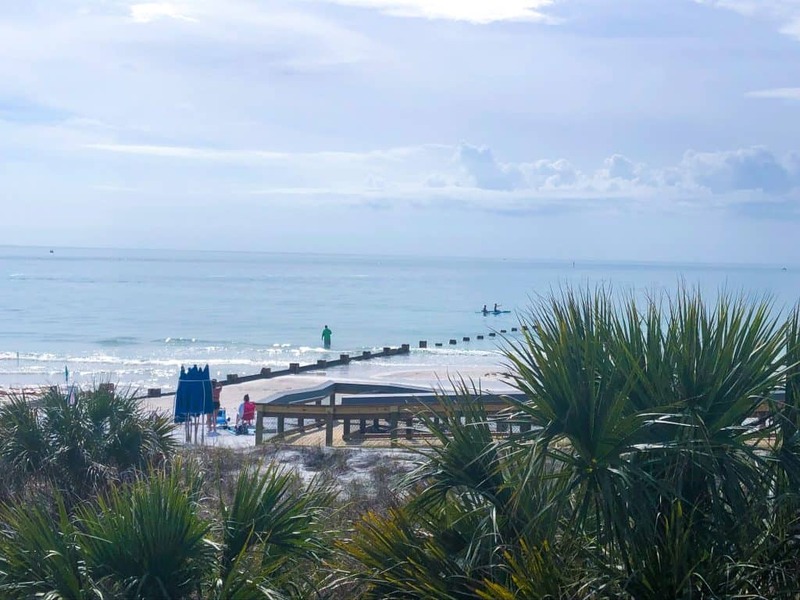 On the west coast of Florida about 30 minutes west of Tampa International Airport and just north of Clearwater, Honeymoon Island is located on over 350 acres of land (not including water areas). Honeymoon Island was voted the #10 beach of the Top 25 Beaches in America by TripAdvisor in 2009. The cost to enter is $8 per car and $2 per bicycle. With your Florida State Parks Individual annual pass, admission is free for one person with additional people costing $2. With a Family annual pass admission is free for up to 8 people. Honeymoon Island has about 4 miles of sugar sand beaches that are undeveloped outside of the restaurant/restroom areas on either end of the beach. 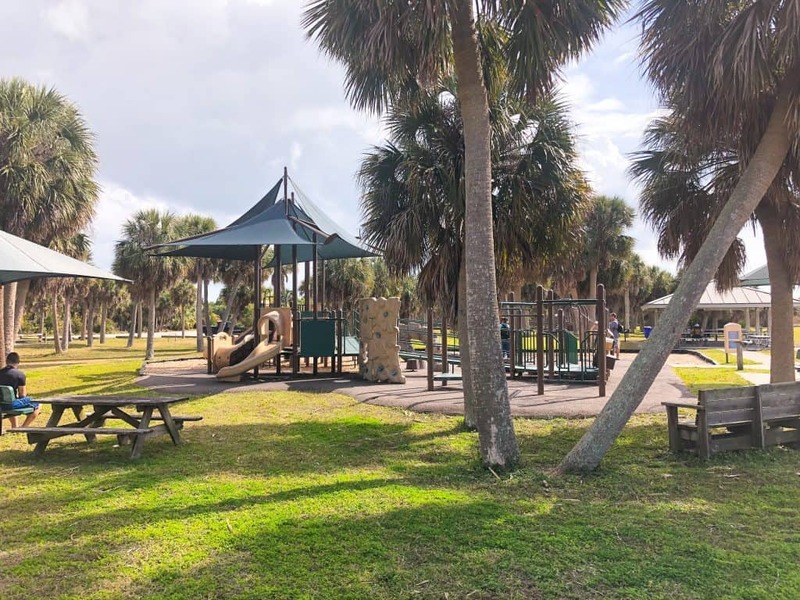 While the park can get crowded on certain days, it’s a big difference from visiting Clearwater Beach or the other beaches in the area. Those beaches are developed and can be extremely crowded during the tourist season. Visiting Honeymoon Island’s beaches is like taking a step into the past. Be sure to use caution when swimming the beaches. Honeymoon Island does not have lifeguards on duty and sometimes you may encounter riptides. Remember that live shelling is not allowed at Honeymoon Island. When you find a shell, turn it over and see if anyone is making the shell its home. If it shell has an occupant throw it back into the water. Nothing in it? It’s yours to take! 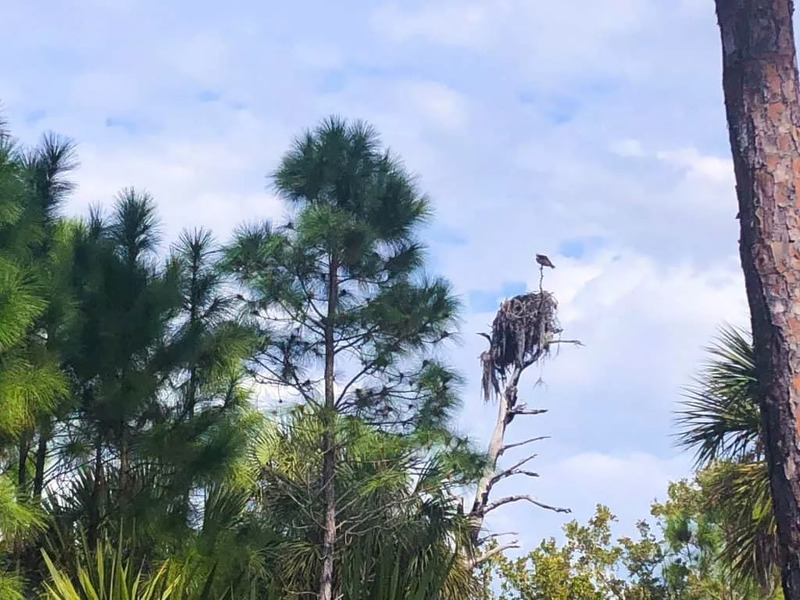 If you feel like taking a hike, there are two trails on Honeymoon Island: Osprey Trail, which is 2 miles long, and Pelican Cove Trail, which is less than a mile. We saw lots of osprey and osprey nests when we walked the beginning of the Osprey Trail. Don’t feel like trekking by foot? Osprey Trail allows you to ride your bike if that’s your preferred mode of transportation. Both trails have minimal grade so they’re good for beginners. Bring a pair of binoculars with you – there’s lots to see. 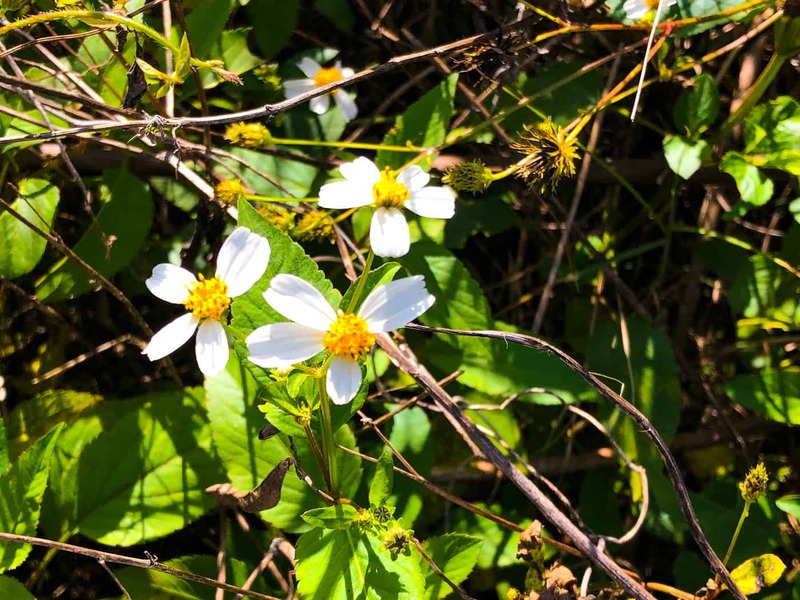 On Osprey Trail you’ll see a variety of flora (wax myrtle, goldenrod, Christmas berry, winged sumac) and fauna (osprey, snakes, raccoons, gopher tortoise). Wherever you walk on Honeymoon Island, aside from the beach area, be sure to wear comfortable closed toe shoes while hiking. Rattlesnakes are prevalent on the island and while you’re most likely not to run into one, it’s best to stick to the official trails and not allow your dogs to go into the brush. After your hike make sure you visit the Nature Center. This is where you’ll get your stamp for your Real Florida Passport (or purchase a passport book if you need one), but it also has a complete history of the island and a garden of native plants of Florida. 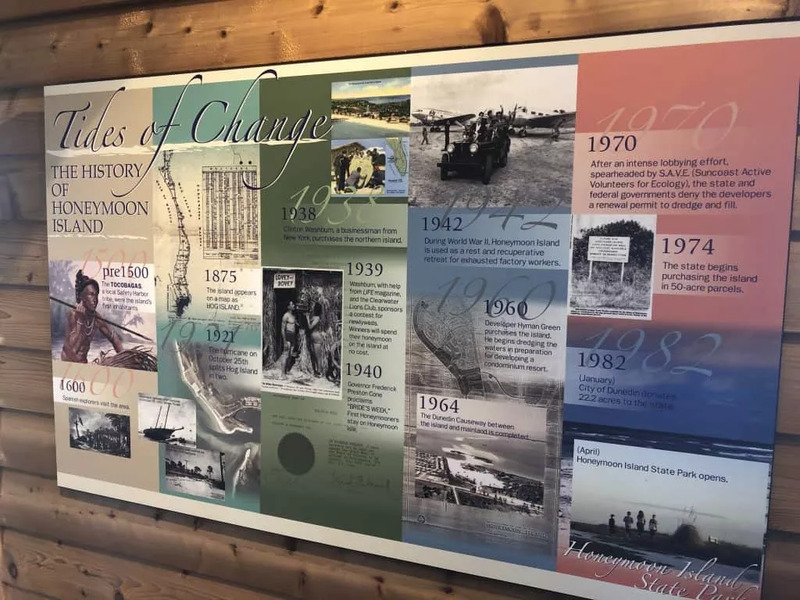 While visiting the Nature Center you’ll find out how Honeymoon Island got its name, see images of some of the island’s animal inhabitants and learn about Myrtle Scharrer. Myrtle was the only child born on what was then known as Hog Island. She lived there with her dad and rowed herself to school every day 2 miles each way across St. Joseph Sound. Honeymoon Island is rare because it has a pet friendly beach which is located at the southern part of the island (near the ferry pickup for Caladesi Island). Pets on a 6-ft leash are also allowed on the trails. Food is available at two restaurants, Honeymoon Cafe and Honeymoon Pavilion. Both restaurants are located on the south side beach which is closest to the entrance. Each offers a variety of cooked foods such as hamburgers, hot dogs, fried fish and fries along with ice cream, water and sodas. Sit on their patios and you’ll have a great view of the water while you eat. You can also bring your own cooler and food if you’d like. Leave the alcohol behind because alcohol is not permitted at Florida State Parks. If you feel like enjoying a beer or wine while on Honeymoon Island you can visit one of the restaurants. They sell alcoholic beverages but they must be consumed on the restaurants’ patio areas. 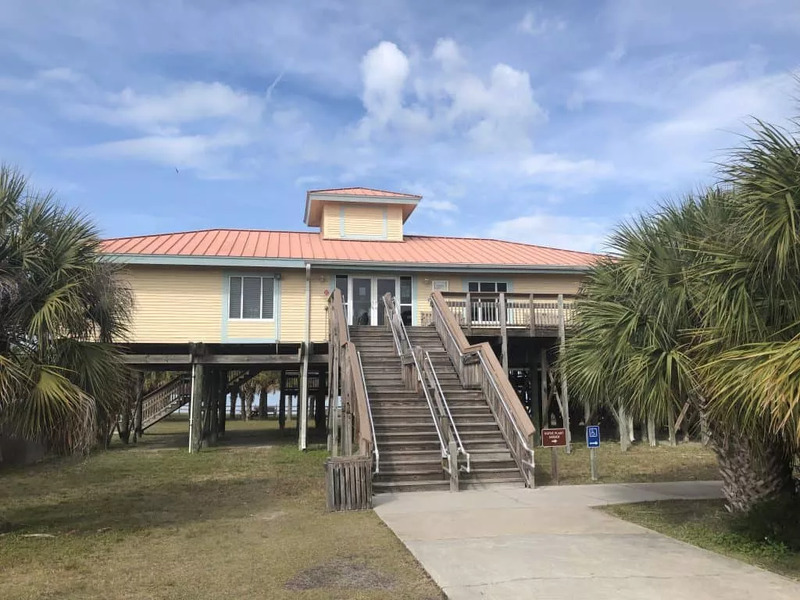 Restrooms are available at both beaches (which also have changing stalls), the nature center and near the playground. 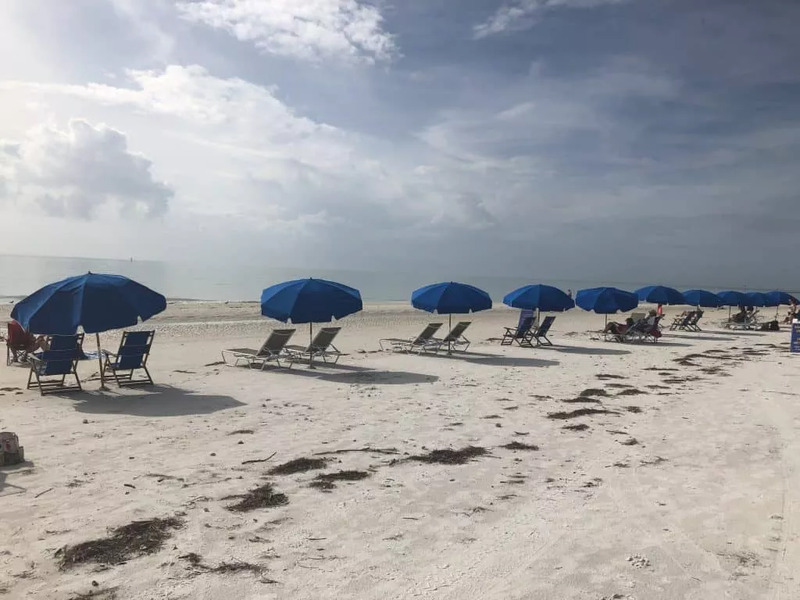 While visiting Honeymoon Island you can rent kayaks, beach chairs, beach umbrellas and 4-wheeled tricycles at the cafes. There are also pavilions available for rental for picnics and grilling (grills available) and a playground for kids near the entrance to Osprey Trail. To rent a pavilion call (727) 469-5942. 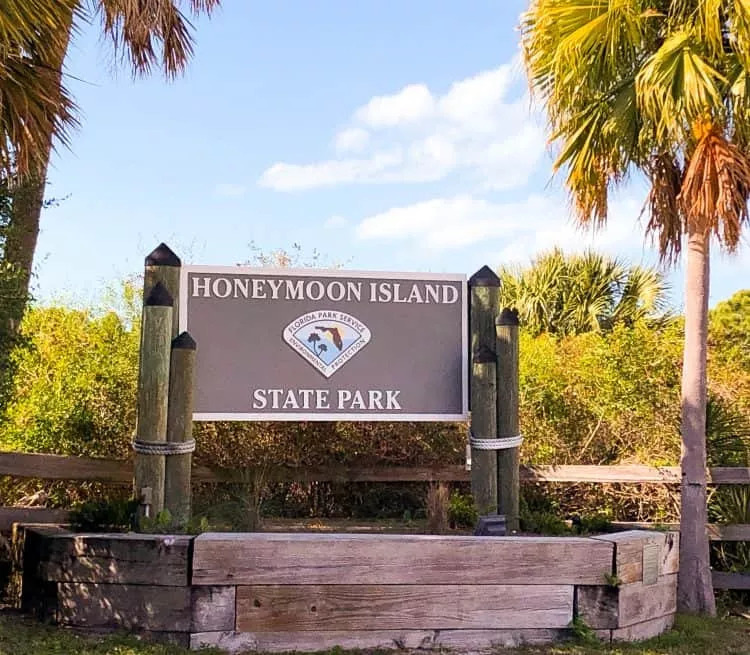 There is no overnight camping or accommodations on Honeymoon Island. Honeymoon Island is located at the end of the Dunedin Causeway in Dunedin, FL. 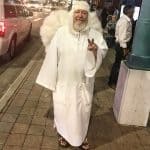 When people think of visiting Florida, a lot of times they immediately think of visiting Disney or going to Harry Potter world. While those are fun, there’s more to Florida than amusement parks. Like visiting the Florida State Parks. With an average cost of entry to each park of $3 to $8 per car, it’s very inexpensive to learn more about Florida’s ecosystem and history. Another great perk? The parks are so vastly different you can be at the beach on the west coast of the state one trip, be visiting Florida’s highest waterfall and natural sinkholes the next and then head off to the battlefield where the Second Seminole War began. 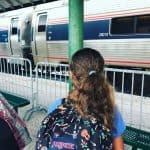 To put all of this perspective and help Florida visitors and residents decide which parks are right for them, I’m going to be blogging about my visit to each of the 175 venues in the Florida Park Service system. 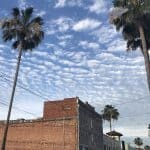 I’m really excited about this and although there are blogs here written previously about parks such as Blue Spring and the Ybor Museum, updated posts will be written about them. I’ve previously written exclusively about Weeki Wachee, and won’t be creating a new blog for that park. Every park is different but there are a few things that are consistent to most locations. So we’ll be talking about each park and mentioning Things To Do, Rentals, Accommodations, Pet Friendly and Food & Restrooms. We’ll try to be fairly standard so readers can compare each park as equally as possible. There are couple of tools to use when going to the state parks that will make the trips easier. The first is the Florida State Parks Annual Pass. This pass provides entrance to each park for a flat fee ($60 for individuals or $120 for a pass that allows entrance to up to 8 people to each park). It’s perfect for full-time residents, snowbirds or even those who want to visit Florida RV parks. 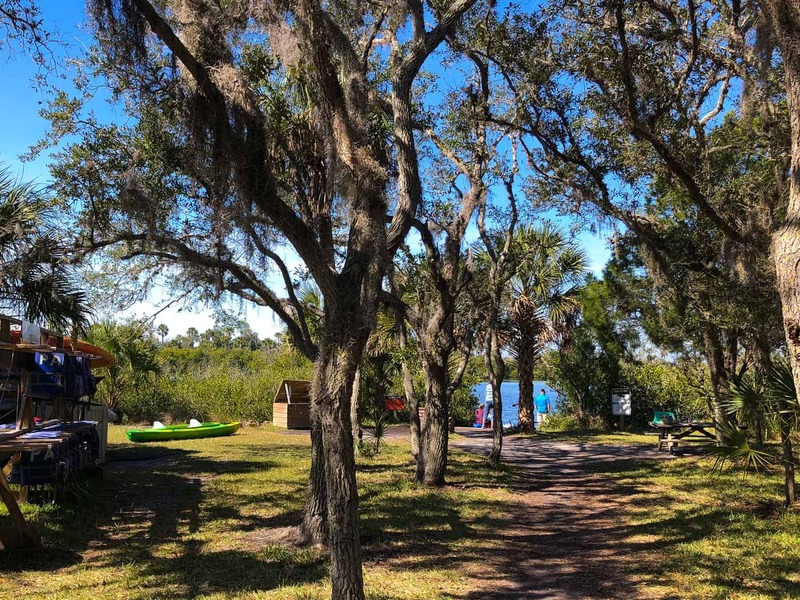 Did you know that many of the Florida state parks offer camping facilities, including those for RVs? Another is the State Parks Passport, which will help me keep track of which park has been visited and how many more there are to go. The passport can be purchased at select state parks and is divided into 8 categories to help you locate the one closest to your region. Every time you visit a park you get your passport stamped by a park ranger; once you’ve gotten all of your stamps, you’ll receive a free annual family pass! According to a park ranger at Honeymoon Island, it takes the average person 3 to 4 years to visit all of the parks. It might take longer than that to produce all of the blogs. But my love of the natural beauty of the state of Florida will get me through. I hope you’ll come along for the ride! 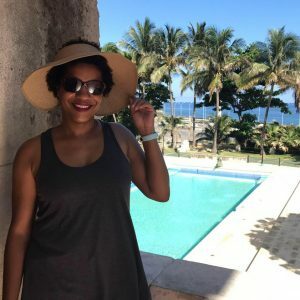 Want to follow my adventures of visiting all of the state parks in Florida? 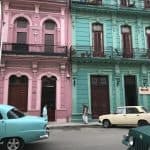 Sign up for my newsletter and be sure to follow me on Facebook, Twitter, Instagram and Pinterest. I’ve always loved a mermaid. And manatees. Did you know that originally sailors thought that manatees were mermaids? Kind of amusing since manatees weight about 650 lbs : ) I’m not sure why I have a love for both. It could be because I’m a Pisces who loves being near the water. 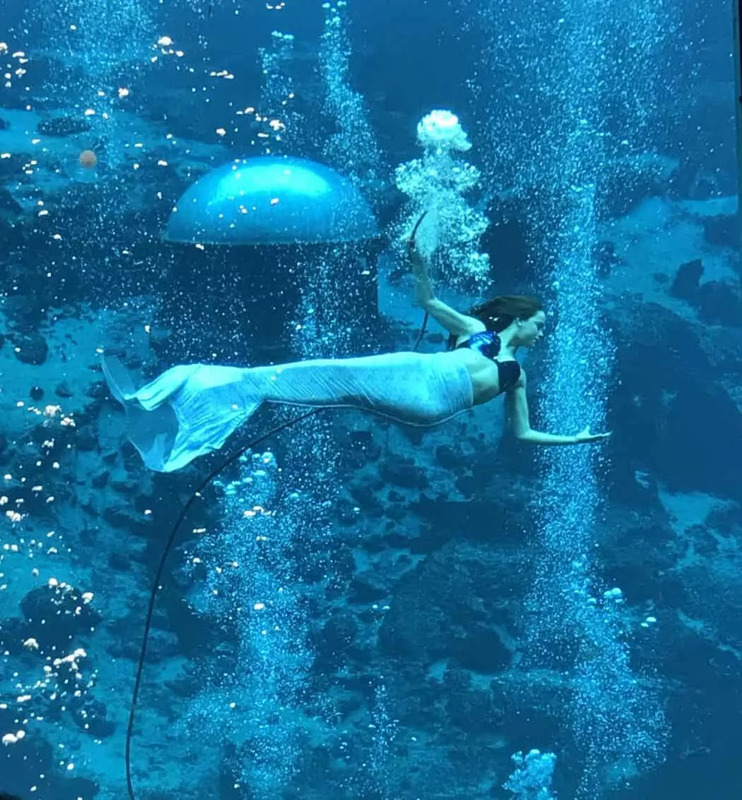 I’m lucky enough to live near a place where I can see mermaids AND manatees – what better place to see my water mates together than at Weeki Wachee Springs State Park? A little more than an hour drive north of Clearwater, Weeki Wachee Park opened in 1947. The vision of a former Navy man, it is located at natural springs that pushes out about 117 million gallons of fresh water each day. 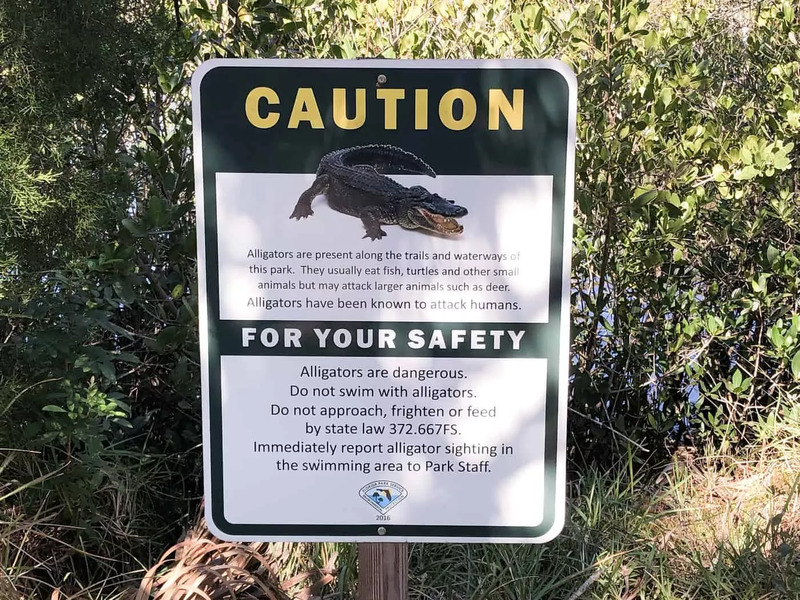 Weeki Wachee, which is a part of the Florida State Park system, can be so crowded in the summer that they close the park down soon after they open because of capacity levels. During the winter months though, the on-site water park Buccaneer Bay is closed which, along with school being in session, means smaller crowds and short or no lines. After the animal show we hopped on the river cruise. This was included in the price of admission and takes you 1 mile down the Weeki Wachee River. Crystal clear, you can see fish swimming and, if you’re lucky enough, also glimpse manatees. The captain gives a great synopsis about the flora and fauna that inhabit the park along with little anecdotes about the area. There are a few places in the park to grab a bite to eat. They’re all quick service style but the food is good and the prices aren’t bad. 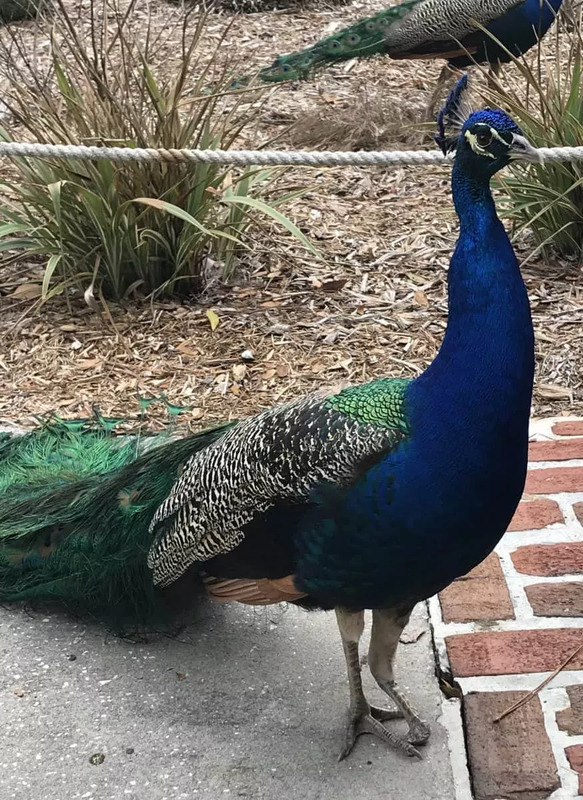 Beware the peacocks roaming around though – they’ll try to steal your fries! We caught two mermaid shows that day – Fish Tails and (of course) The Little Mermaid. Fish Tails was a great synopsis of the shows that used to be performed when the park was first opened, including eating apples and drinking from a bottle. We were even treated during The Little Mermaid show to have a special appearance by a manatee who swam behind the mermaids as if it was a totally normal thing. I had thought that the breathing tubes the laides use to stay underwater longer would distract me from the mermaid’s performances. However they didn’t! The ballet that they do underwater was spectacular and you’re really transported to another place. The theater where you watch the show is located 16 feet below the spring’s surface and the water the mermaids (and the manatees!) swim in is always 74.2 degree Fahrenheit. It can take up to a year for a mermaid to get trained fully. The mermaid auditions take place very few years and the audition process is facinating. 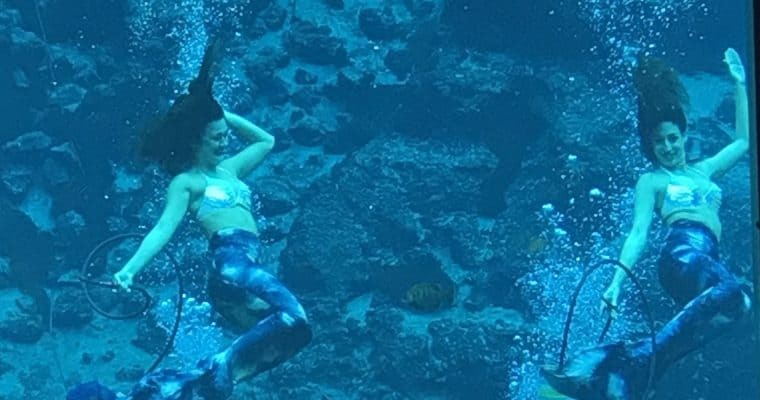 Of course my swimming obsessed daughter now has her sights set on working as a mermaid at Weeki Wachee when she turns 18. I can’t really blame her – I’m planning on going to applying for the Sirens of the Deep Mermaid Camp next year! But Weeki Wachee isn’t only mermaids. 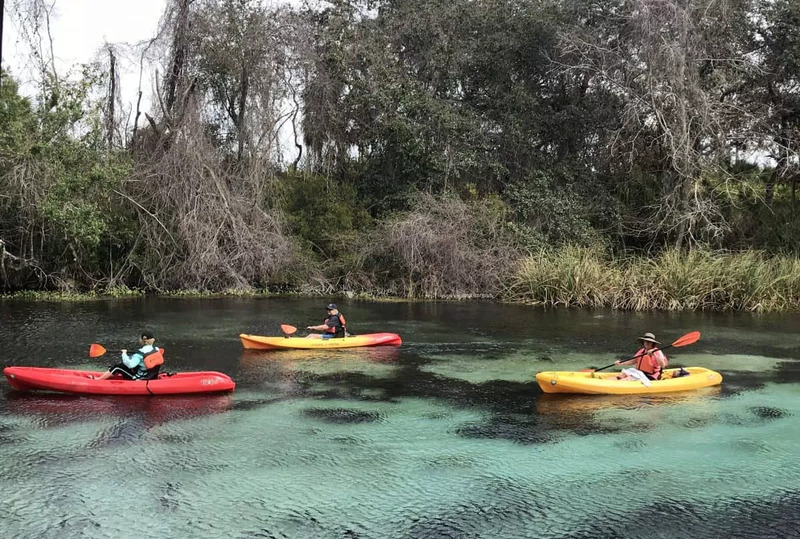 There are several locations along the river where you can rent a kayak or stand-up paddleboard and explore the springs. We chose to do a kayak trip another time but my husband tasked me with heading to Marker 48 Brewing to get a growler filled. They had some great brews with Florida themes so if you’re a beer lover be sure to stop by. Old school Florida attractions aren’t as popular as they once were with all the big theme parks around now. 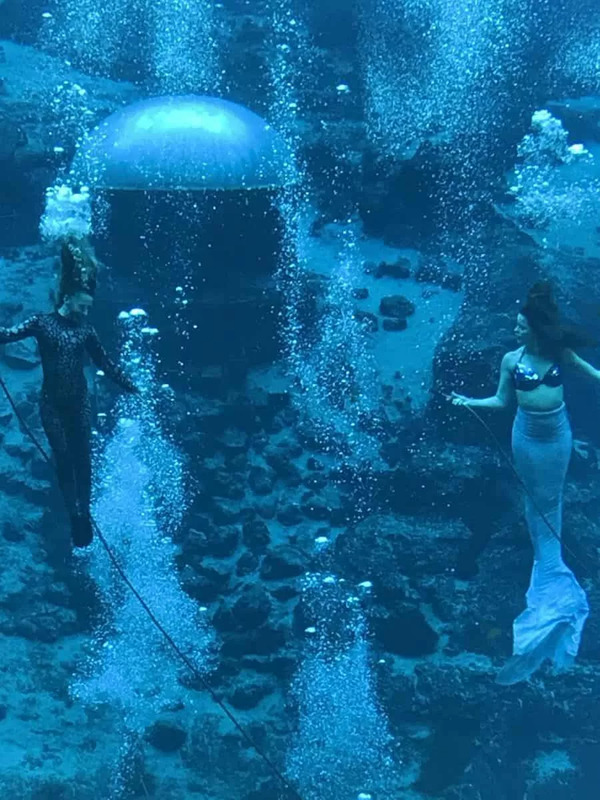 Weeki Wachee is an attraction that isn’t wild and crazy and doesn’t have a ton of attractions. 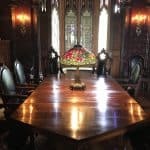 However it’s a treasure that thankfully the state of Florida has saved so if you have a chance and a few hours to spare, make sure you visit. The mermaids (and the manatees) will greet you with a smile and make you feel at home. The cost to enter Weeki Wachee Springs is $13 for adults and $8 for children ages 6 to 12 (children 5 and under are Free). With a Florida Individual Annual Pass, park entry is good for one person to Weeki Wachee. With a Florida Family Annual Pass, park entry is good for two people. Note: Weeki Wachee Spring State Park is undergoing renovations – the mermaid show, river boat ride and animal show are closed and scheduled to reopen mid June, 2019. To stay up to date as to when they’ll reopen, follow their Facebook page. Buccaneer Bay will reopen in mid-March, 2019.